60% of respondents came in to the centre of Bruton once a day or more. This is a higher proportion than in 1996 (47%), but that survey covered a wider geographical area than this one. Unsurprisingly those living further away tended to come in less often, but even so they still came in a lot (nearly 40% of those living in Cuckoo Hill came in every day). Bruton is very much a walking town: 70% came in on foot, and 57% of those from Cuckoo Hill walked in when they came in. If the survey is representative, then somewhere around 1,000 Brutonians walk into the town centre every day, and around 250 drive. wider pavements and better public transport also had a majority in favour of most important. There was no consensus about the need for more parking, with almost equal numbers making it most important as made it least. Non-drivers tended to see more parking as least important, whereas a small majority of drivers saw it as most important. When people were asked what else could be done to make it easier and safer to get around town, the most commonly mentioned issue was speeding and the need for the 20 mph limit, mentioned in total by 28% of those answering the question. 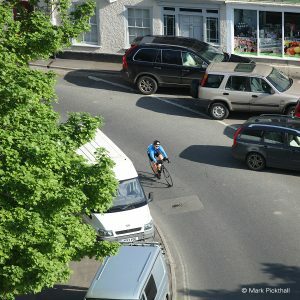 Pavements and crossings were also mentioned frequently, particularly for the Library Junction, where six people thought there should be traffic lights and seven a zebra crossing. The most common concern about pavements was that they were too narrow, but there were also calls for pavements on some roads that have none. There was no clear consensus about the need for residents’ parking permits, but a small majority (14%) were against the proposal. There was a strong majority against introducing parking charges (71% more for strongly disagree or disagree than voted for agree or strongly agree). The Library Junction stood out as the location most in need of improvement: it had the highest number of votes for being high priority and the least giving it low priority. The majority in favour of it being high priority was 74%, and 218 people gave it high priority (the second biggest vote for anything in the entire survey). Disabled access to the Westbound platform at the station was the next highest priority (majority 71%). Quaperlake Street (majority 29%) and the High Street (majority 30%) were the next most significant. In the 1996 survey the Library corner was identified as the second most important traffic hazard (after speeding) so it seems that little has changed.